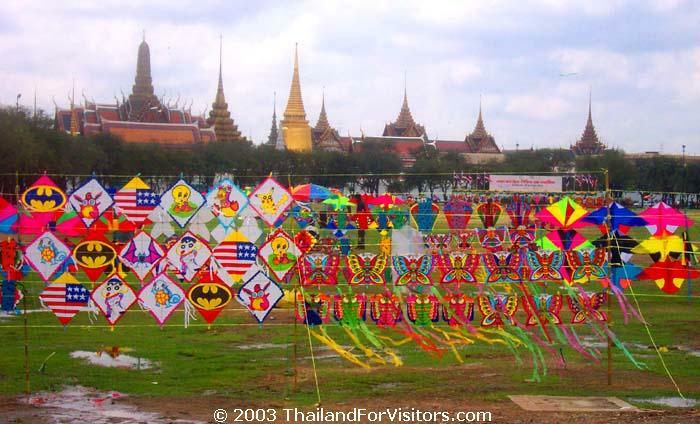 Kites on sale in Bangkok's Sanam Luang. If you visit Thailand, particularly Bangkok, around late February or March, you'll likely see some people flying kites in the larger parks, especially Sanam Luang in front of the Grand Palace. You'll also see kites on sale all around the country. During this time, there are contests all over the country. The most popular contests involving kites are the ones where two teams are pitted against each other. One team flies a single large 'male' kite shaped like a fleur-de-lis and called chula, while the other team flies the small diamond-shaped 'female' pakpaos. The object is for the chula to snare the pakpaos and drag it into its territory. The mild modern appearance of this pastime belies its early beginnings in thirteenth century Sukhothai, when kites filled with gunpowder and long fuses were flown over enemy territory. It was around this same time that kites began to be used in some religious ceremonies. The kites were strung in such a way to vibrate and make noise. Some farmers still use these today to scare away birds. Kite flying saw a resurgence during the reign of King Chulalongkorn, who saw it as a 'wholesome' pastime.